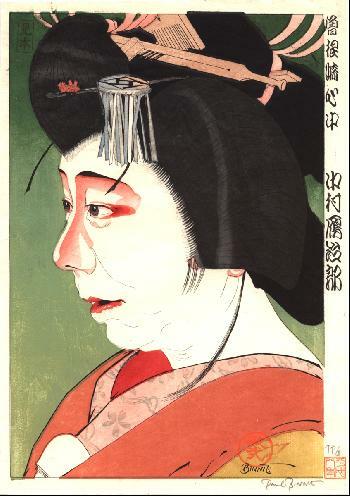 Nakamura Ganjirô in "The Love-suicides at Sonezaki" - Ganjirô - Sonezaki Shinj? Paper size: 28.7 x 41 cm. Published in September 1996. This is a "Mihon", a proof edition, with a different background colour (green instead of dark blue) - see: Paul Binnie - A Dialogue with the Past, p. 81. This Mihon edition has the Mihon seal top left and is identical to the edition print, apart from the green background.